Reading and share top 10 famous quotes and sayings about Complainers by famous authors and people. 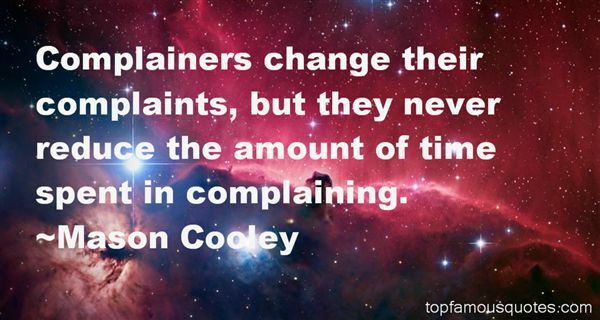 Browse top 10 famous quotes and sayings about Complainers by most favorite authors. 1. "The fun-seekers, I noted, were spontaneous and flexible. They approached each day and each situation with a willingness to ride whatever wave came along, just for the experience of it. The complainers, on the other hand, would only catch a wave if it was exactly to their liking. Anything else drew loud protestations about how it was not what they expected." 2. "If we look back into history for the character of present sects in Christianity, we shall find few that have not in their turns been persecutors, and complainers of persecution. The primitive Christians thought persecution extremely wrong in the Pagans, but practised it on one another. The first Protestants of the Church of England, blamed persecution in the Roman church, but practised it against the Puritans: these found it wrong in the Bishops, but fell into the same practice themselves both here and in New England. [Letter to the London Packet, 3 June 1772]"
3. "Men always complained I had a lot of boyfriends. I never agreed, or disagreed. I was too busy kissing to care. I disapproved of jealous complainers and had not an opinion on their opinion of me." 4. "It is a general popular error to suppose the loudest complainers for the public to be the most anxious for its welfare." 5. "O that we would so love the gospel and have so much compassion for lost people that tribulation and distress and persecution and famine and nakedness and danger and sword and gun and terrorist would turn us not into fearful complainers, but bold heralds of good news." 6. "I came to hate the complainers, with their dry and crumbly lipsticks and their wrinkled rage and their stupid, flaccid, old-people sun hats with brims the breadth of Saturn's rings." 7. "Complainers change their complaints, but they never reduce the amount of time spent in complaining." 8. 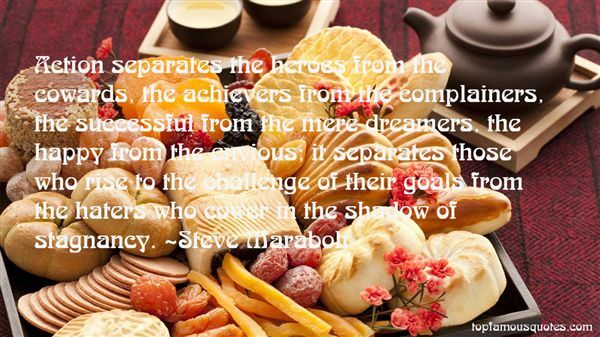 "Action separates the heroes from the cowards, the achievers from the complainers, the successful from the mere dreamers, the happy from the envious; it separates those who rise to the challenge of their goals from the haters who cower in the shadow of stagnancy." 9. "Human progress has never been shaped by commentators, complainers or cynics." 10. "Legalism breeds a sense of entitlement that turns us into complainers." Dear Uncle Bernard - Your niece Frances - a four-eyed, French-plaited platypus awaiting the evaporation of h baby fat - thanks you very much for the romantic advice. But I've never been one to spend time thinking about why men and women take to each other, or why they don't. I think it can turn a lady neurotic, a term I despise but also am loath to have turned in my direction."